Update:We are sold out for March. Please email us at info@adduplex.com if you want to be the first to be notified when we are looking to fill the spots for April. In February we did a little experiment of offering one of the apps to replace our default “no-ad” ad for a month at an extremely good rate. The performance of the campaign has been great so far. The ad already got more than 30 million impressions even though we promised to deliver only 10 over the whole month. This means that, even if campaign ended today, our February advertiser paid only $0.03 per thousand impressions and, since it’s not over yet, it will end up even cheaper. 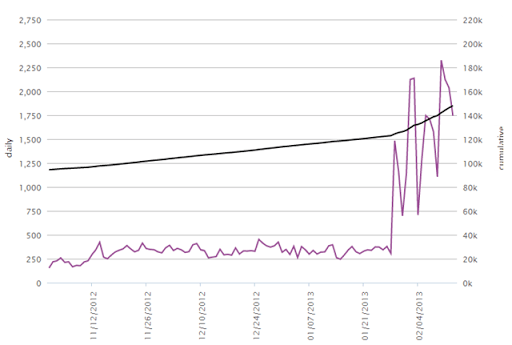 The app’s downloads (as you can see in the chart above) went from around 300-400 a day to around 2,000. We will do a case study with more details when the month is over. There’s one negative aspect though. A whole month for a single ad at such frequency is probably too much and we are starting to see a “burn out” effect. Therefore we decided to do a different ad for each week in March. We make a promise of at least 5 million impressions per week (will reimburse in regular campaign if not met) at the same rate of less than $0.10 CPM. So the price for a week is $495. As before the “catch” is that there’s only 1 ad and no way to change or target it. And it’s all about Windows Phone (not Windows 8). Sounds interesting? Want to get your app to the next level at the best price ever? Drop us a line at info@adduplex.com. As you can see the space is limited and we will pick advertiser on the first-come basis (with some consideration for the relevance of advertised product), so act quickly if you want to take advantage of this offer.